I posted previously about a mot failure but decided this issue was best dealt with in a new thread. 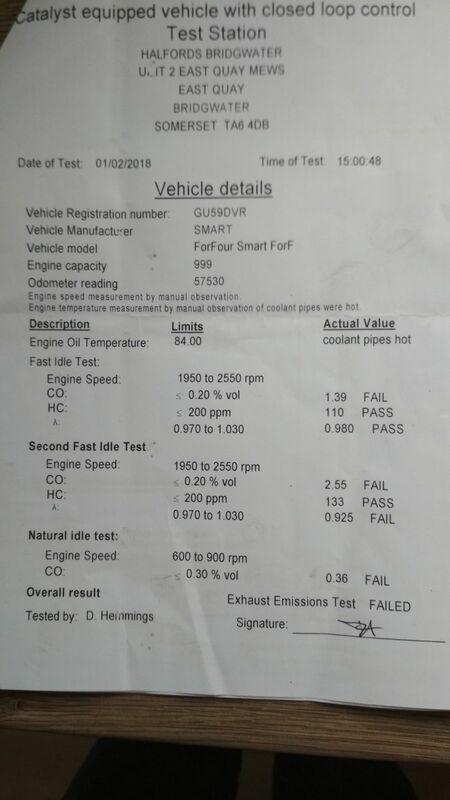 Our 451 failed its MOT on the emission test. So far we have replaced the Cat/Exhaust, and then the lambda sensors, but the test is still giving the same results as when it first failed. 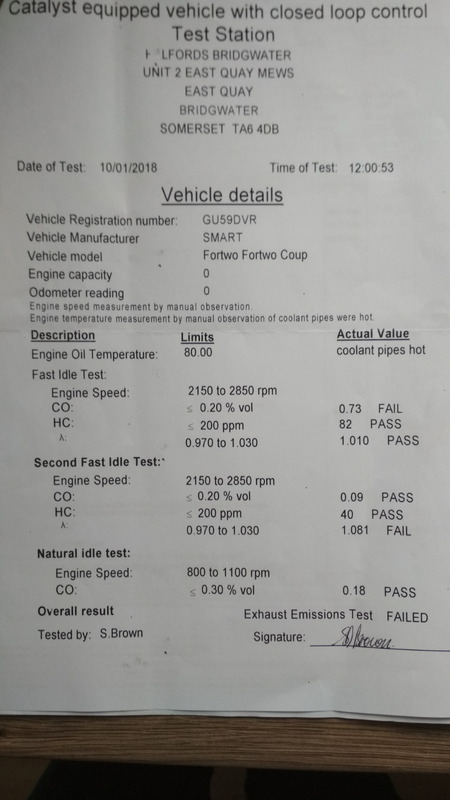 The MOT centre suggested that the results were indicating that the fuel mixture is so high that it is outside the ability of the first sensor to adjust it. The idle speed is also outside of the range set for a pass for the 451 at 950. Unfortunately, not being Mercedes or Smart specialists, the MOT centre say they cannot suggest where the problem might be. So - does this make any sense to others, and more importantly, can anyone suggest how I determine what is causing the problem or how to remedy it. So far we have spent over £400 on the problem and we are no further forward. You could visit a Merc dealer or Independent Dealer with full Diagnostic kit and get the ECU software updated. One could think of it inversely, how much air is getting into the engine? I'd go and see if anything was blocking up the air intake. I'd also go and see how warm the engine is getting... is it getting up to regular temperature? If the car thinks it is colder than it actually is, then it'll try to add more fuel into the mixture when it doesn't need to. I guess all the regular service items have been done? Possibly also the Fuel Pressure Regulator? I do sympathise though, my 450 is having the same issue although the idling speed is OK (it is forever failing on CO emissions at the moment). When was the last update released?? 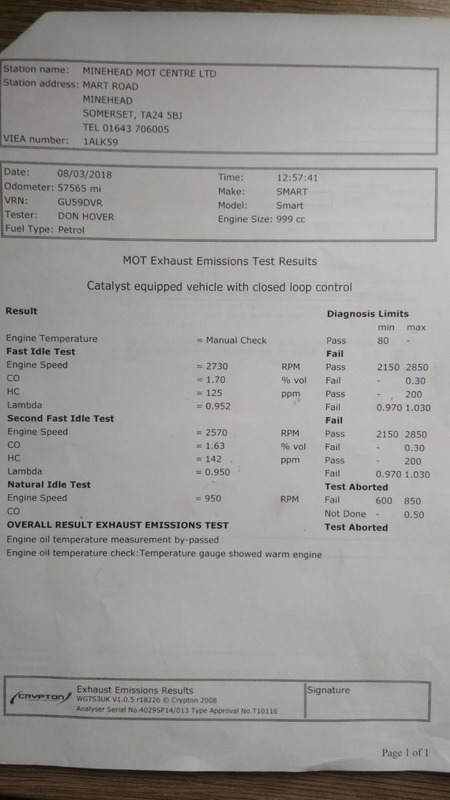 The MOT centre put the car on their diagnostic kit and found a few old faults which they cleared, but nothing that indicated anything that would cause the emission problem. The last report (after the new lambda were fitted) is the same as the third report. Last edited by pewe; 14-03-2018 at 09:53 PM. Sorry, the images were reduced when I added them to the reply. Hopefully they will tell you something. A similar problem elsewhere on the 'net (different car) and the suggestion is faulty MAF, faults in which do not show as fault codes or prompt EML to light up. Does the 451 have a MAF? The CO and Lambda figures match well, showing the rich condition isn't caused by e.g. an exhaust leak. One possibility is a faulty coolant temperature sensor, or thermostat. If the engine is running cold (thermostat) or the ECU sees the engine running cold (temperature sensor) then it will run the engine rich. Another recommendation was to read the fuel trim data to see what the ECU is trying to do with the mixture. EG, it may be trying to lean it because there is a dribbling injector. Or richen it, as above post suggests, if it's getting poor temperature data. Can you plug a reader into the OBD11 socket & read live data? I know I can on my 450 using my Chinese Delphi DS105E unit. That way maybe you'll be able to see what the water temperature & MAF sensor are reading.